2015 Christianity Today Award of Merit (The Church/Pastoral Leadership) 2014 Readers' Choice Awards Honorable Mention 2014 Best Books About the Church from Byron Borger, Hearts and Minds Bookstore "When . . . faith communities begin connecting together, in and for the neighborhood, they learn to depend on God for strength to love, forgive and show grace like never before. . . . 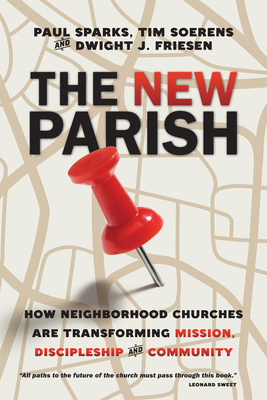 The gospel becomes so much more tangible and compelling when the local church is actually a part of the community, connected to the struggles of the people, and even the land itself." Paul Sparks, Tim Soerens and Dwight J. Friesen have seen in cities, suburbs and small towns all over North America how powerful the gospel can be when it takes root in the context of a place, at the intersection of geography, demography, economy and culture. This is not a new idea the concept of a parish is as old as Paul's letters to the various communities of the ancient church. But in an age of dislocation and disengagement, the notion of a church that knows its place and gives itself to where it finds itself is like a breath of fresh air, like a sign of new life.